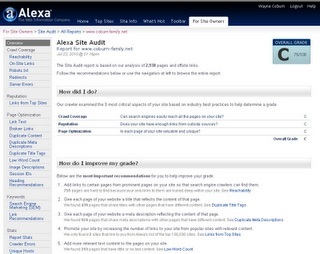 Apparently Alexa has created some new feature to scan and check your web site (up to 10,000 pages) which they are calling Alexa Site Audit. For a nice fee of $199! I don't know about any of you, but in my opinion this seems a bit steep. Although they seem to provide a lot of information in the report (based on their screen shots anyway), most of what they mention can be performed at a variety of sites for free. Granted you may have to visit several sites to get all of the same or similar info and reports. The other thing I wonder is just how accurate their reports or audit will be. I mean what are they basing all of this on. I also take into consideration Alexa's history of providing traffic rank, which is nowhere near accurate. I guess if you have $199 to burn and would like to get all these stats in one convenient report then go for it. They might attract a few customers, and probably a few more if it was a little cheaper. I think I will be passing on the Alexa Audit Report for the time being!